Hey there! I hope you all had a good New Years. This is Anagram-Daine, here on behalf of Watercress studios and their art department. It is nice to make your acquaintance. I have never written a blog, but I imagine that all one needs to do is speak their mind, and get to the point. This will be a two parter dev blog because we had the long Christmas break, I will start first and pass you off to my good pal TheDwarfLard. I am one of Watercress's Artists. /u/OptionalSauce saw me and plucked me from /r/katawashoujo. A majority of what I have done for the team has been allocated to the creation of concept sketches of characters as they are discussed, or random requests as they come up. I would claim myself as more of a part-time artist due to IRL duties that interfere, but I try my best. 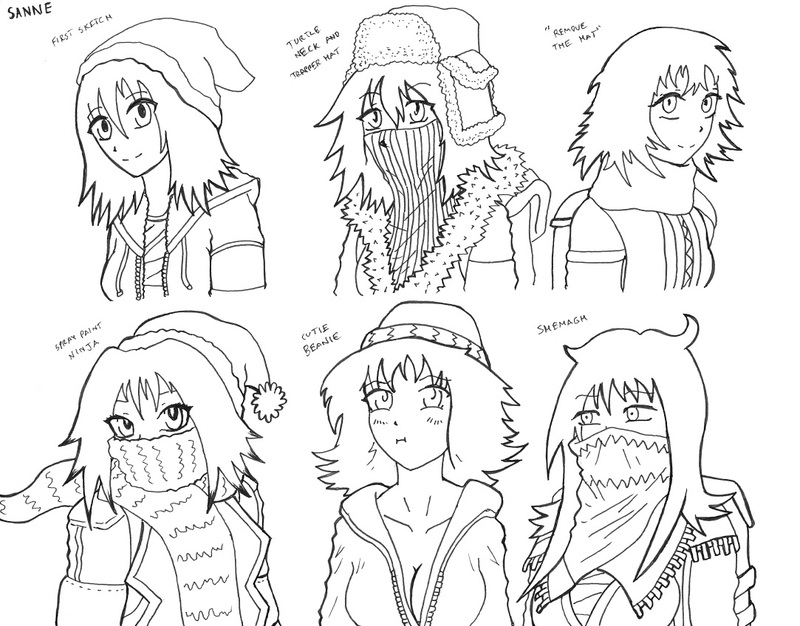 Here is some concept sketches of Timo. I may have went off the beaten path a little for fun. At the moment, we do not have a set artistic style of how to portray our characters. Fret not, things are on the way, and concept art is the more free spirited side of a project because it is the process of growth, where we bring characters and places to life. It is fun, and it is the foundation for everything yet to come. While I have taken artistic liberties and skimmed over the details of certain characters from time to time for fun, the serious job of an conceptual artist is to bring the character to life the way the writer sees. If the writer likes it, you are done and you move on to the next task, if not, you must rinse and repeat. That might sound boring and almost one sided, but there is more to it than that. Having two different skills sets in both the writer and artist means that they must both work together to make the characters come to life, otherwise it won't feel right. As more concept art is produced, it generates discussion that eventually leads to a mutual understanding of how the characters should appear, and the becomes more apparent. Both the writer and artist get the other to think, which is important. Each side should be passionate about getting it right, because you want to get it right. 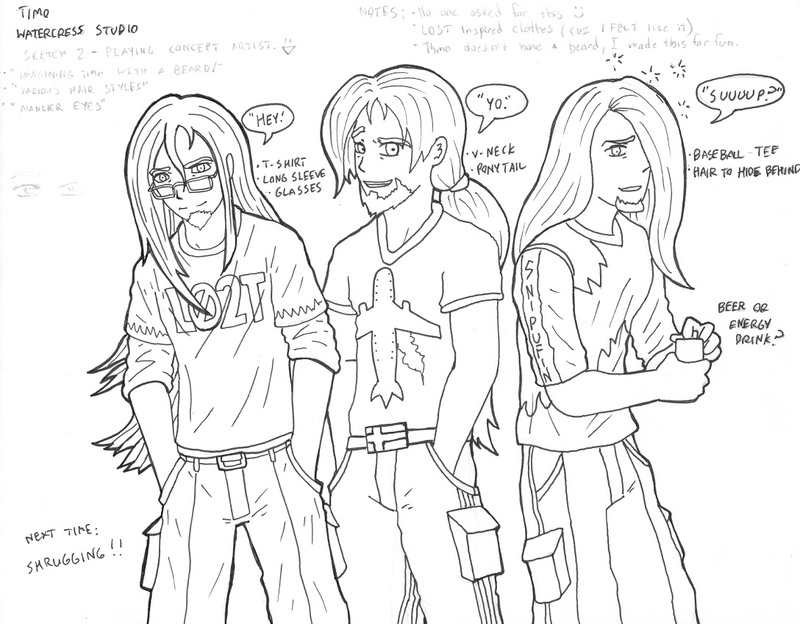 Concept art is also good for the other artists as well. When interpretations and ideas can bounce off of each other, you can get a whole new perspective and ideas to improve your own art. 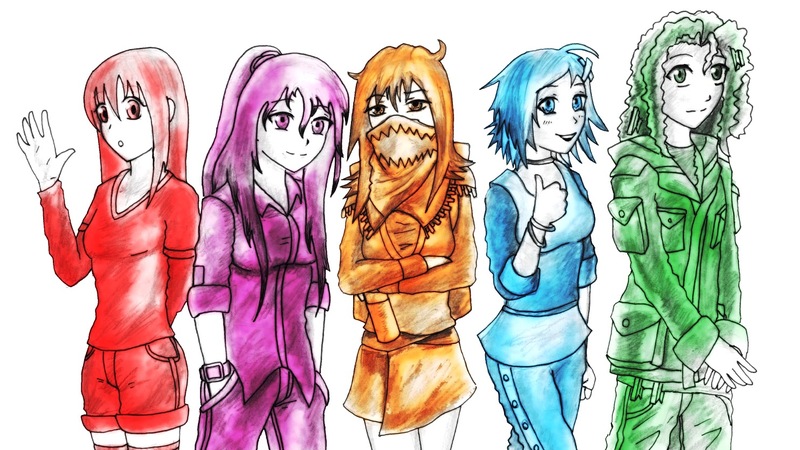 Concept art of some of the main characters and their character colours. If you can't do something, you have to let people know. Relationships become strained when you say you will do something and then awkwardly vanish. It's the same thing in a team setting. At the very least, if you don't want to explain why, explain that you will be absent. The gesture is appreciated, and in case people miss it the first time, check in and remind people of your absence. Be genuine about it because people can't call you out for being genuine. Give or remind people ways to contact you if need be. If feel like you are going to be flakey, warn people you are going to be flakey. It is what I do. It might be a non Tony the Tiger attitude, but it's great to at least let people know what is up. There have been countless times where I simply do not make something because I glance at other artists much more talented than myself. This is a good way to place yourself in a rut. I always love to look at people much better than me which and become envious, which saps my artistic motivation. If you doubt yourself, you give power to your doubt! Don't do that. Don't succumb to envy, instead admire other artwork and strive towards bettering yourself, and study what makes those images great and appropriate what you learn into your own practices. Remember that you are working towards that every time the pencil hits the paper. It takes time. People like effort, and effort means progression. Oh. Sanne might be slowly becoming my favorite, I compiled a cleaner version of all the previous sketches I’ve made of her into this to show you the progression of Character design. I think that wraps up my bits here, I shall pass you off to TheDwarfLard, woohoo! This is going to be a possibly rare occurrence in /r/Avitus developer blogs where it's going to be written by two different people. Considering it's been a few weeks since the last one, it only makes sense to have two people cover it. I'm TheDwarfLard, one of the assistant writers, coders, and an Artist Co-Coordinator at Watercress Studios. I should start with how I came to be a part of Watercress. Compared to many other members, the way I joined was on the stranger side. Most members are looked at by the team they'd be a part of and then the appropriate members will contact the person in question if the person would make a great addition to the team. What happened in my case is that I contacted a member of the writing team, asking if they needed anything for their project. They did, and I became a member of the writing team, being Hanna's assistant writer. Progress over the past three weeks or so has been understandably slow, but it should begin to pick up speed around now. There's still a lot to be done for the writing team. Each scene needs to be drafted more than once to allow for as many ideas as possible to be considered. Eventually, we'll be at the point where the drafts will all come together to form our final product, or at least something very close to it. That won't be for some time, but knowing where you're heading is nice. For coding, scripting is the area I work in. It's essentially just putting the scenes/drafts into Ren'Py format. Nothing too interesting there. As /u/Anagram-Daine said, the writers do have influence over the other aspects of Avitus. All teams do. The art and music both need to work well for the characters for a better experience going through the final product. If one aspect doesn't fit with the others, it's going to stand out, and will be adjusted appropriately. In the end, everything should come together beautifully and there will be a product we can all be proud of. Additionally, covered by Anagram, communication and not comparing yourself to others is very important for the writing team, as well as the other teams. If the teams don't communicate, there's going to be a huge mess that won't be cleared up easily. If someone starts comparing themselves to others and gets down about it, their work, and possibly the entire team they belong to, will take a hit as well. All of us are in this together, so we need to work together to the best of our abilities. Just because someone may appear to be better at something, that doesn't mean that your input is any less meaningful. Important details someone missed could be noticed and would either improve the project or maybe even avert a disaster. We've got a long road ahead of us, but that doesn't mean that everything needs to be work all the time. Working constantly would cause people to become exhausted and take leaves from the team. Progress may end up being a little slower, but remaining passionate about the project is incredibly important. It's difficult to put out good work if you don't care about something.